Not quite ready to dedicate your entire life to your on-track escapades? 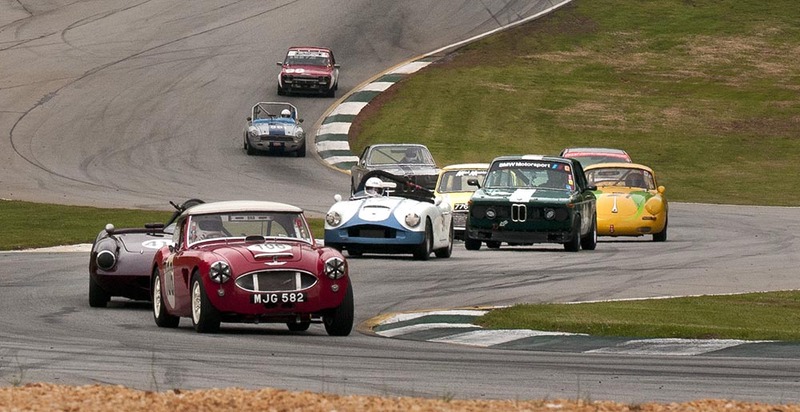 How about some tips for the rest of us—those who'd just like to fully enjoy our classics, whether it's slicing through Road Atlanta's esses or traversing our favorite mountain pass? Carl Heideman has gotten intimate with just about every form of classic machinery, from '50s Fords to Britain's best. He knows a bit about what makes our classics tick and has some speed secrets to share. You don’t need the latest and greatest high-tech ignition system in your car, but you do need one that’s strong and dead-nuts consistent. Hold a timing light on your engine while it’s running at 5000 rpm: If it’s not giving you a super-stable reading, your ignition system could use some work. We usually find that a fully rebuilt distributor–again, that’s rebuilt, not just cleaned up–teamed with a Pertronix ignitor solves a lot of woes. Hoses, lines and wires do fail, but problems usually occur at a junction. Are your systems as simple as they can be, or is your fuel pump actually powered by three wires spliced together? On a related note, how are your grounds? Going Fast Doesn't do you any good if the car keeps breaking and can’t finish a race or make it over that pass. Constantly check the car for loose wires, stray cables and simple adjustments that have gone out of spec. For example, does your throttle still open all the way? And is the cable going to last the whole weekend, or is it about to pull out of its stop? Just buzzing to the redline before shifting isn’t good enough. If you’ve gone to the dyno, you can figure out your best shift points and put them to use. An illuminated shift light can be your friend here, although a piece of red tape stuck on the face of the tachometer works well, too. Get a probe pyrometer to make sure your tire pressures and alignments are correct. Tire temperatures should be even across the tread. Get an infrared pyrometer to make sure your brakes are all about the same temperature. Know exactly where your ignition timing is set. The bottom line is that when you measure things and record that data, you can take an informed, diagnostic approach to speeding up. Call us lazy, but we don’t always like going through our entire toolbox before beginning every repair. Hand tools are relatively inexpensive, so we’ll buy some duplicates and keep them bunched together for specific fixes. For example, we’ll keep together everything needed to bleed the brakes. It makes for less stress when time is short. Talk to the guys who are going faster than you and see if they’ll give you some pointers. If they’re good, they’ll know what works and why they’re passing you. If they’re nice, they’ll tell you. When and how you ask can be important here. After their third beer during the evening social is probably better than while sitting on the grid. Everyone has their theories about why they’re faster or better. Listen to them all, but learn to separate the snake oil from the superstition from the silver bullets. If something doesn’t make sense, it probably doesn’t work. Most factors come down to math, physics, and thermal law. A Ph.D. isn’t necessary–if you understand some basic concepts, your common sense will provide the answers you need. There are now so many testing opportunities out there that it’s silly to not take advantage of them. From local autocrosses to noncompetitive track events, there are plenty of opportunities to shake down a car before that big weekend. Not sure your skills are sharp enough? Hire a seasoned driver for the day. We see two common and opposite problems on race cars. Sometimes things are sloppy–like linkages that have too much free play or wear. Sometimes things are in bind, like an anti-roll bar whose geometry doesn’t match the suspension. Too often we see both at the same time, which can be dangerous. An anti-roll bar that is in bind will wear components, causing slop that will eventually lead to catastrophic failure. All very good information, I wish most racers would take note. Yellow flags for mechanical failures burn-up a lot of track time. I've fielded a lot of tech support calls that turned out to be something on that list. #4 is one that even experienced racers have a hard time learning. Depending on gear ratios and engine characteristics you can often short shift and land right on the top of the torque peak in the next gear instead winding the nuts off it as a matter of course. I managed to get one guy to take my suggestion - he claimed a power peak at 7,000 rpm I asked him to go out and do 3 laps (which I'd time) faithfully doing 6,000, then 3 lps at 6500, then the last 3 at 7,000. Turned out that regardless of where his actual power peak was, 6500 was just as fast as a 7,000 shift. Probably saved him an early rebuild. Don't know why some racers are so stubbornly wedded to (sometimes incorrect) theory when it is so simple to just go out and try it and see.